The Grand Tetons, the Mormon Barn, The Million Dollar Cowboy Bar, and the Antler Arches on the town square downtown Jackson Hole are just a few of the most memorable and most photographed features of the valley. As Jackson transformed from a mountain man town into a dude ranch town the antler arches grew in popularity with family travelers and locals alike. There are four antler arches, one marking each corner of the town square. 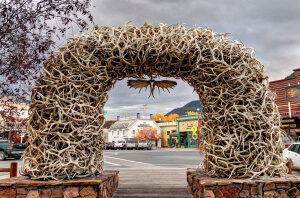 Though there isn’t an exact date of when the first arch was built and placed on the town square, most sources cite 1960 as the year the first antler arch was added to the town square. In 2007 they began to replace the arches, and auctioned off the old weathered ones. 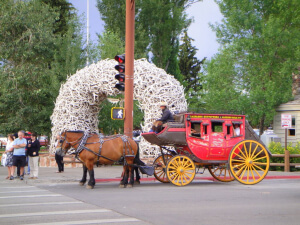 Each arch contains about 10,000 pounds of elk antlers. Don’t worry not one elk was harmed in the making of the arches. Elk grow antlers that they shed annually. Unlike horns that must be cut off and are hollow inside, antlers, fall off naturally and are solid. Starting May 1 locals, tourist, and the local Boy Scout club hit the National Forests and Elk Refuge in search of the all the antler sheds. Each year at the Old West Days the Boy Scouts put on an auction where they sell their antlers. Others sell them to jewelers, furniture makers, private deals, dealers from overseas, or just keep them to enjoy in their own homes. 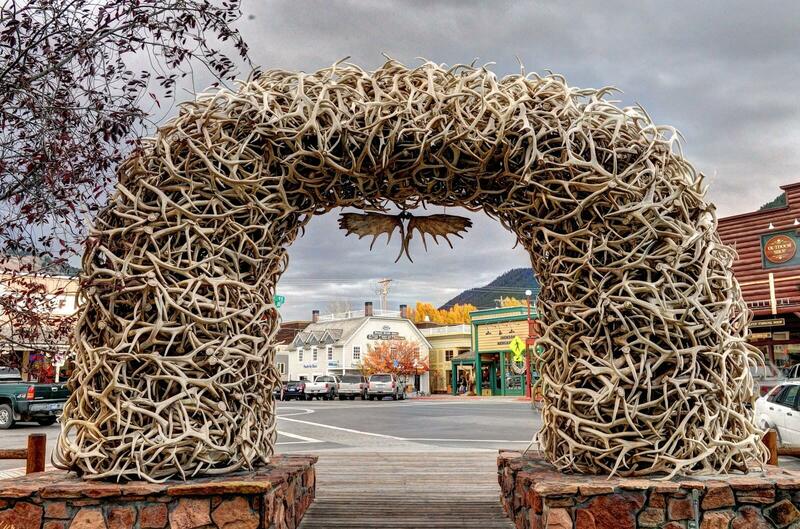 Next time you are in Jackson Hole Wyoming on vacation, make sure you stop by the town square and get your iconic picture in front of the JH Antler Arches.